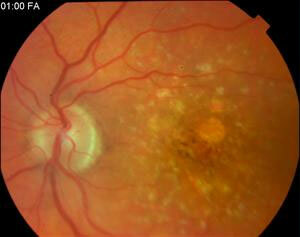 There are two types of macular degeneration (MD), wet and dry. Almost without exception, wet MD starts as dry MD. Generally speaking, dry MD is not nearly as severe as wet. Our goal, whenever we find someone with dry macular degeneration or any precursor to dry macular degeneration, is to try to reverse dry MD changes and prevent dry MD from advancing to wet MD. Either type of macular degeneration can affect the central vision and can make it difficult for a person to see detail. MD can take away the ability to read, watch television or drive. Even though peripheral vision is preserved with MD, central vision loss can be devastating. Wet MD can be treated with shots and laser, but the outcomes are generally poor. Dry MD on the other hand can actually be reversed in some cases with proper nutrition and good health practices. Supplements that are used to help prevent disease are called nutriceuticals. Of all the nutriceuticals on the market currently we believe the Zeavision product called RESTORE is the best. We will let you know if a better product becomes available. Ask McCalla Eyecare Center if one or two tablets per day is appropriate for you. If you are a vegetarian, EYE PROMISE is a good nutriceutical for you. Ask McCalla Eyecare Center if one or two tablets per day are recommended. You should also be taking a good multivitamin. Resveratrol has been shown to reverse macular degeneration in some patients. Resveratrol can be purchased on line at www.longevinex.com or by calling 866-405-4000. Ask McCalla Eyecare Center if he feels Resveratrol would benefit you and, if so, whether one or two tablets per day is appropriate for you. Green leafy vegetables like spinach and kale contain high concentrations of both lutein and zeaxanthin and food is always a better source of vitamins and minerals than pills. Red peppers, green peppers, carrots, broccoli and sweet potatoes are also good sources of “eye vitamins”. Fish and most fruits and vegetables are also good for the eyes. Exercise is also beneficial to macular health. However, it is almost impossible to get all of what you need through diet alone. On the other hand smoking, a sedentary lifestyle, high consumption of red meat, high blood sugars or excess fat in the diet can all contribute to macular damage. McCalla Eyecare Center and staff are committed to early detection and aggressive management of Macular Degeneration. We want you to be able to continue to see the world.